Whether designing a Family or Master bathroom, Wet-room or Cloakroom, Corian® offers incredible versatility. Corian Bathrooms – With its design versatility, Corian® solid surface is a vital component in many exciting bathroom designs, including elegant basins and shower trays, sleek wetrooms, Zen-influenced baths, and ergonomically designed schemes with curved vanity units. 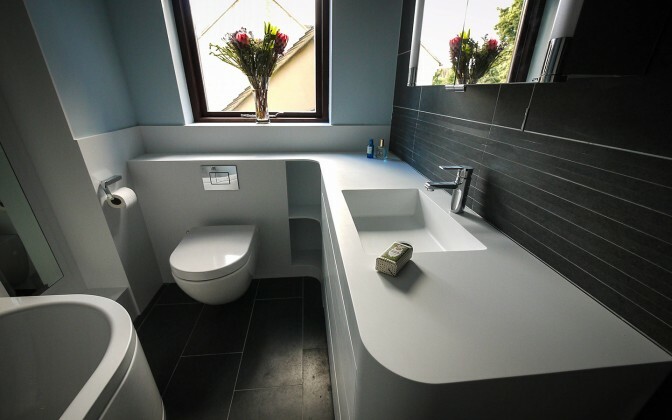 Whether designing a Family or Master bathroom, Wet-room or Cloakroom, Corian offers incredible versatility in the application of Corian Bathrooms. Rather than buying an off the shelf shower tray and making it fit the space, we can make a bespoke size which is guaranteed to make the most of the available space. In a range of colours, Corian ® shower trays can be manufactured to meet any project. Take a look at our inspiration book for further bathroom ideas and examples of work completed by Counter Production. Click here to look at some of our projects. Vanity units, using Corian® bowls offers another opportunity for a seamless look. Silicone or grouting can be replaced with seamless design and flush fitting material, all totally water proof – perfect for corian bathrooms. Bespoke cabinets with drawers or doors in Corian create another opportunity for clean lines and innovative design. Corian® products, such as basins and back splashes, can be perfectly integrated to create the sleek impression of a single flowing surface. With seamlessly streamlined features, there are no visible joints or cracks to collect dirt and moisture. DuPont™ Corian® solid surface is easy to clean – it’s nonporous, so stains do not penetrate the surface. With proper cleaning, Corian® also resists the growth of mould, mildew and bacteria. To complete their customer’s dream bathroom, some of our clients have commissioned Corian® baths. Please do contact us if you have such a proposal. Alternatively, there are three ready made Corian baths that can transform the bathroom into a beautiful oasis of wellness and refinement. Highly versatile, the three Corian® Delight models – symmetrical semi-finished oval and rectangular models with top; oval freestanding model – feature a reversible design and match any interior style across both residential and commercial environments.